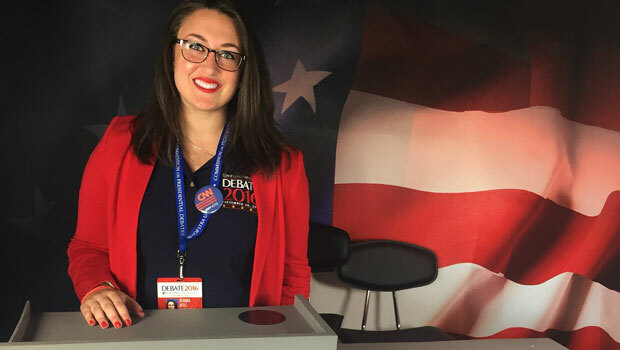 Hofstra Law second-year student Deanna Wolf volunteered to work as an usher at the first 2016 presidential debate, which was hosted by Hofstra University on Sept. 26. Hofstra is the first university to host three consecutive presidential debates. Wolf, who is interested in public service, entered Hofstra Law with a B.S. in applied economics from the University of Rhode Island, where she was also a research assistant and a Division I softball player. At Hofstra Law, she is a member on the Hofstra Law Review and a research assistant to Professor James Sample, an expert in voting rights, constitutional issues and issues related to democracy. Why did you decide to volunteer at the debate? I decided to volunteer at the debate to be part of history. But I also decided to volunteer because I wanted the experience of working at a political event. It is a goal of mine to work on a campaign one day. What was the experience like inside the debate hall? I was among a small group of people who were privileged to be inside of the debate hall hours before it became filled with members of the media, photographers, ticket holders and campaign staffers. Because of that, I had time to “take in the moment” and think about the extraordinary event that would be occurring later on that evening. But no matter how much time passed by, I was still amazed I was afforded the opportunity to be inside of the debate hall that evening. Then, as the time to the start of the debate began to dwindle down and the Mack Center was steadily filling with hundreds people, there was not one person who walked by me that did not stop for a moment to simply observe the sheer marvel of their surroundings. It did not matter what candidate anyone supported, because the experience of awe was felt by all, and I think that is something both red and blue can agree upon. When there was one minute left before the live broadcast was to begin, Lester Holt turned around from his desk and signaled to the audience that it was almost show time — that one minute was the quietest the debate hall was all evening, despite the fact everyone was told to remain quiet throughout the entire program. Every spectator was eagerly waiting to see the candidates walk onto the stage and come face to face with each other for the first time this election cycle. Those 60 seconds felt like an eternity … but when Lester Holt finally announced the candidates, it was surreal to watch both of them walk onto the stage, and to see months’ worth of anticipation culminate in a matter of seconds. That was my favorite moment. Are you working on any law school projects related to government or elections? Currently, I am working on two law school projects related to government and elections. I am a research assistant to Professor James Sample, and we are working on drafting an article about judicial elections and appointments that will be published this coming spring as part of a symposium for DePaul Law School. I am also writing a note as part of my membership on the Hofstra Law Review, in which I am discussing how there is a constitutional right to lie in campaigns and elections, and am developing a public financing proposal to curb said lying. What do you want to do after law school? Something in government or public service? After law school, I aspire to clerk for a judge. I interned at the Suffolk County Attorney’s Office this past summer, and in the spring I will be interning at the U.S. Attorney’s Office. I do have an interest in public service and can see myself continuing to work in the public sector in the future, although I am not opposed to working at a firm either.